Posted December 18th, 2016 by Mike Boyes & filed under Anxiety OC PTSD, Consciousness, Death and Dying, Depression, Development of the Self, Human Development, Stress Coping - Health, Stress: Coping Reducing, The Self. Description: Off the top of your head what you think the relationship might be between spirituality and mental health? Certainly one possibility, for which there is research support, is that the involvement in a spiritual group provides a degree of social support which may be of assistance in coping with mental health issues. On the other hand, might there be a relationship between the sorts of things one thinks about when one is engaged spiritually that might also be of assistance? The research described in the article linked below looked at the extent to which individuals had either avoided or given serious thought to the fundamental existential questions of life (why are we here? etc.) and mental health. Before you read the article think about what you might expect the results of the study to suggest. Source: Avoiding spiritual struggles and existential questions is linked with poorer mental health, Science Daily. The research study discussed in the article linked above seems to suggest that taking life’s existential question seriously and giving them some thought may actually reduce the intensity of the struggles associated with anxiety and depression should they arise. Why might that be? The study suggests that it is the rigidity associated with refusing to address those sorts of problems that may also contribute difficulties to the business of dealing with anxiety and depression. Certainly the vast research literature pointing to the importance of doing some work on your sense of personal identity during your adolescent and young adult years contains large numbers of findings that essentially parallel those discussed in the research article linked above. If you think about it, figuring out who you are, where you’re going, how you’re going to get there, and why are at the same time questions about personal identity and to a certain extent also questions about one’s place in the world (which is really what spirituality is about). Perhaps taking life’s questions seriously is quite important? What kinds of relationships might you expect between spirituality and psychological adjustment? Does it make sense to suggest that we keep issues of spirituality separate from psychological issues? Why or why not? What sort of definition of spirituality might we come up with if we do want to consider its role in psychological functioning and adjustment? Reutter, K. K., & Bigatti, S. M. (2015, April). 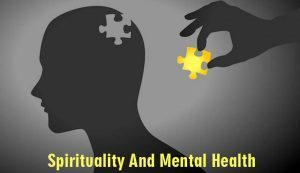 Spirituality and Mental Health. In Nova Science Publishers, Inc..
Chatters, L. M., Taylor, R. J., Woodward, A. T., & Nicklett, E. J. (2015). Social support from church and family members and depressive symptoms among older African Americans. The American Journal of Geriatric Psychiatry, 23(6), 559-567.